Two brain regions—the medial frontal and lateral prefrontal cortices—control most executive function. Robert Reinhart used high-definition transcranial alternating current stimulation (HD-tACS) to synchronize oscillations between them, improving brain processing. De-synchronizing did the opposite. Robert Reinhart calls the medial frontal cortex the "alarm bell of the brain." "If you make an error, this brain area fires," says Reinhart, an assistant professor of psychological and brain sciences at Boston University. "If I tell you that you make an error, it also fires. If something surprises you, it fires." Hit a sour note on the piano and the medial frontal cortex lights up, helping you correct your mistake as fast as possible. In healthy people, this region of the brain works hand in hand (or perhaps lobe in lobe) with a nearby region, the lateral prefrontal cortex, an area that stores rules and goals and also plays an important role in changing our decisions and actions. "These are maybe the two most fundamental brain areas involved with executive function and self-control," says Reinhart, who used a new technique called high-definition transcranial alternating current stimulation (HD-tACS) to stimulate these two regions with electrodes placed on a participant's scalp. Using this new technology, he found that improving the synchronization of brain waves, or oscillations, between these two regions enhanced their communication with each other, allowing participants to perform better on laboratory tasks related to learning and self-control. Conversely, de-synchronizing or disrupting the timing of the brain waves in these regions impaired participants' ability to learn and control their behavior, an effect that Reinhart could quickly fix by changing how he delivered the electrical stimulation. The work, published October 9, 2017, in the journal Proceedings of the National Academy of Sciences (PNAS), suggests that electrical stimulation can quickly—and reversibly—increase or decrease executive function in healthy people and change their behavior. These findings may someday lead to tools that can enhance normal brain function, possibly helping treat disorders from anxiety to autism. "We're always looking for a link between brain activity and behavior—it's not enough to have just one of those things. That's part of what makes this finding so exciting," says David Somers, a BU professor of psychological and brain sciences, who was not involved with the study. Somers likens the stimulation to a "turbo charge" for your brain. "It's really easy to mess things up in the brain but much harder to actually improve function." 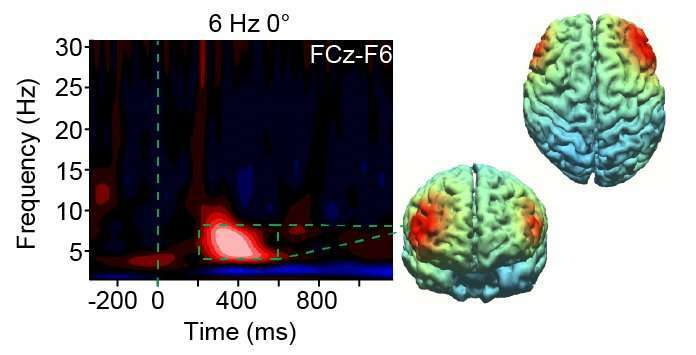 Research has recently suggested that populations of millions of cells in the medial frontal cortex and the lateral prefrontal cortex may communicate with each other through the precise timing of their synchronized oscillations, and these brain rhythms appear to occur at a relatively low frequency (about four to eight cycles per second). While scientists have studied these waves before, Reinhart is the first to use HD-tACS to test how these populations of cells interact and whether their interactions are behaviorally useful for learning and decision-making. 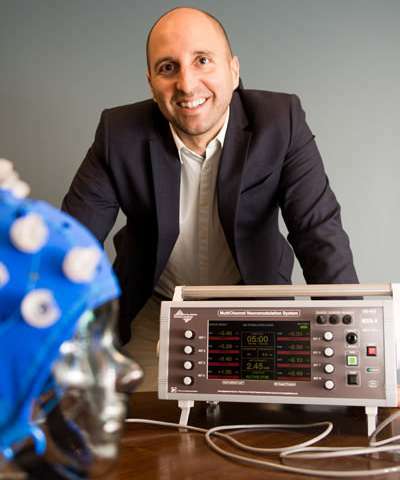 In his work, funded by the National Institutes of Health, Reinhart is able to use HD-tACS to isolate and alter these two specific brain regions, while also recording participants' electrical brain activity via electroencephalogram (EEG). "The science is much stronger, much more precise than what's been done earlier," says Somers. In his first round of studies, Reinhart tested 30 healthy participants. Each subject wore a soft cap fitted with electrodes that stimulated brain activity, while additional electrodes monitored brain waves. (The procedure is safe, noninvasive, and doesn't hurt, says Reinhart. "There's a slight tingling for the first 30 seconds," he says, "and then people habituate to it.") Then, for 40 minutes, participants performed a time-estimation learning task, pressing a button when they thought 1.7 seconds had passed. Each time, the computer gave them feedback: too fast, too slow, or just right. Reinhart tested each of the 30 participants three times, once up-regulating the oscillations, once disrupting them, and once doing nothing. In tests where Reinhart cranked up the synchrony between the two brain regions, people learned faster, made fewer errors, and—when they did make an error—adjusted their performance more accurately. And, when he instead disrupted the oscillations and decreased the synchrony—in a very rough sense, flicking the switch from "smart" to "dumb"—subjects made more errors and learned slower. The effects were so subtle that the people themselves did not notice any improvement or impairment in the task, but the results were statistically significant. Reinhart then replicated the experiment in 30 new participants, adding another study parameter by looking at only one side of the brain at a time. In all cases, he found that the right hemisphere of the brain was more relevant to changing behavior. Then came the most intriguing part of the study. Thirty more participants came in and tried the task. First, Reinhart temporarily disrupted each subject's brain activity, watching as their brain waves de-synchronized and their performance on the task declined. But this time, in the middle of the task, Reinhart switched the timing of the stimulation—again, turning the knob from "dumb" to "smart." Participants recovered their original levels of brain synchrony and learning behavior within minutes. "We were shocked by the results and how quickly the effects of the stimulation could be reversed," says Reinhart. Though Reinhart cautions that these results are very preliminary, he notes that many psychiatric and neurological disorders—including anxiety, Parkinson's, autism, schizophrenia, ADHD, and Alzheimer's—demonstrate disrupted oscillations. Currently, most of these disorders are treated with drugs that act on receptors throughout the brain. "Drugs are really messy," says Reinhart. "They often affect very large regions of brain." He imagines, instead, a future with precisely targeted brain stimulation that acts only on one critical node of a brain network, "like a finer scalpel." Reinhart's next line of research will test the technology on people with anxiety disorders. There is also, of course, the promise of what the technology might offer to healthy brains. Several companies already market brain stimulation devices that claim to both enhance learning and decrease anxiety. YouTube videos show how to make your own, with double-A batteries and off-the-shelf electronics, a practice Reinhart discourages. "You can hurt yourself," he says. "You can get burned and have current ringing around your head for days." He does, however, see the appeal. "I had volunteers in previous research who came back and said, 'Hey, where can I get one of these? I'd love to have it prior to an exam,'" he says. "That was after we debriefed them and they were reading the papers about it." Somers notes that there are still many questions to answer about the technology before it goes mainstream: How long can the effect last? How big can you make it? Can you generalize from a simple laboratory task to much more complicated endeavors? "But the biggest question," says Somers, "is how far you can go with this technology." "Think about any given workday," says Somers. "You need to be really 'on' for one meeting, so you set aside some time on your lunch break for some brain stimulation. I think a lot of people would be really into that—it would be like three cups of coffee without the jitters." More information: Disruption and rescue of interareal theta phase coupling and adaptive behavior, PNAS (2017).